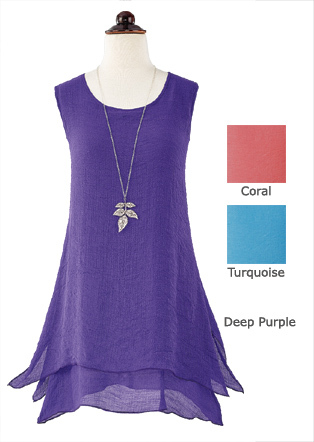 Like a cool breeze as the sun goes down, this lightweight tunic wafts lightly over you, welcomingly cool. Double layers of light crinkle gauze in a subtly variegated weave float to a flared hem; side slits on the top layer add to the breezy motion. Approx. 31" long. Imported. Polyester/cotton; machine wash. Sizes S-XXL. In Deep Purple, Coral or Turquoise.